Four members of the Barber family – Dan, Eula, Ella, and Jesse – were killed on January 14th, 1915. They were taken from jail by a large mob and killed nearby. 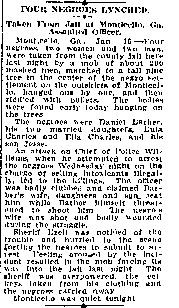 This case created huge outcry compared to others, probably because two women were lynched, and involved possible complicity with local police. 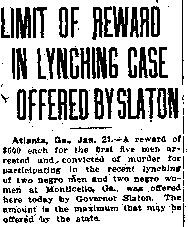 The circumstances and scandal created led the Governor to push for an investigation, making this one of the few lynching cases with indictments and prosecution.